When the days get shorter and Canadian air cuts across the course like a knife, serious winter golfers do not quail. They just play a softer ball—perhaps an orange one to stand out against the frosty grass—and pile on strange clothes to brave the elements. This is a subject this column likes to harp on since we tend to play more often in late fall and winter, when tee times are readily available and courses tend to be empty. In other words, ideal conditions. Fortunately, apparel makers these days are not only good at making cool, lightweight clothing; they also have perfected fabrics and designs that insulate the player from wind and cold. Here are a few items worth considering in terms of winter survival. 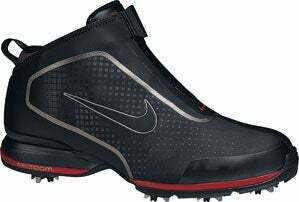 Beginning at the bottom, Nike's Zoom Bandon boots (above) are kind of an amazement. With their ankle-high fit, they look like Beatle boots or basketball shoes, but they are completely seam-sealed, with a zipper-shroud enclosure (no laces to get wet or dirty). In every other respect, they are stable, balanced, high-performance golf shoes. The Nike Bandon boots (everybody seems to be invoking Bandon Dune Golf Resort, along the rain-swept Oregon coast, for weatherproof clothing) are suitable for all kinds of wet weather, warm or cold ($176). What sort of jacket or sweater you wear depends on conditions. Perhaps more critical is what you wear close to the skin. A moisture-wicking compression layer that moves sweat away from the body is essential. Many companies make such form-fitting undergarments. Adidas' ClimaLite Thermal Compression Mock (right) combines the muscle support and reduced friction benefits of a compression layer with a thermal fabric ($40). If conditions are frigid, an even more radical choice is Mizuno's Breath Thermo X-treme shirts (left, $75), which actually grow warmer when wet. We have always been intrigued by Mizuno's Breath Thermo fabric, a pink fluffy substance that resembles the insulation between the walls of your house. Somehow it works. If you work up a sweat in the beginning of the round, the garment will convert it to heat, thus preventing sundown chill. Finally, you want to keep your head warm but still look like a golfer. To top things off, try a golf-cap ear band ($12.50), an innovative accessory from a non-golf outfitter, Duluth Trading, the blue-collar workwear company in Minnesota. This simple fleece design goes over your regular golf cap, through a slot cut for the brim, but keeps the ears protected from the biting cold. How's that for "lobal warming?" There are probably plenty of other clever ideas that northern golfers use to keep themselves comfortable in the cold. If you have any, let us know.